The latest edition of CropChoice$ is ready for your use in your crop planning. With the latest data, planning is even more customized to the producer’s current operation. 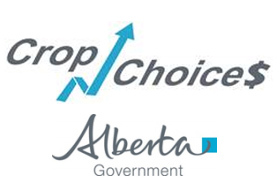 CropChoice$ helps producers choose the best crops for their operation and their bottom line. CropChoice$ is a free software tool, that helps producers make crop planning choices for maximum benefit to their operations and their bottom line. The tool evaluates the risks associated with each crop plan that you may be considering. In fact, it can analyze up to 40 dry land and irrigated crops on up to 32 fields. Probabilities are the key to CropChoice$. The program uses simple user input to define distributions of expected prices and yields. Current premium rates and recent cost data are provided in this tool for your convenience. CropChoice$ is different from other decision tools, because it also measures the risk associated with each alternative, each crop mix and each management scenario. It puts the business manager in the position to identify, measure and manage risks for their operation’s crop plan. You know your operation best! CropChoice$ uses your knowledge of your situation to help forecast your crop enterprise margins. Soil fertility, moisture conditions and market expectations can be part of your estimates of worst, best and most likely values for yields and prices. If you don’t have your own unit costing, CropChoice$ comes with per acre average cost estimates, by crop and soil zone, based on AgriProfit$ benchmarks. These averages can be a starting point and modified to match your own situation.